Continuing the recent focus on military presidents, today we look at general Emílio Garrastazu Médici, the third of five military presidents during Brazil’s dictatorship and the man who governed during the period of greatest repression and human rights violations. 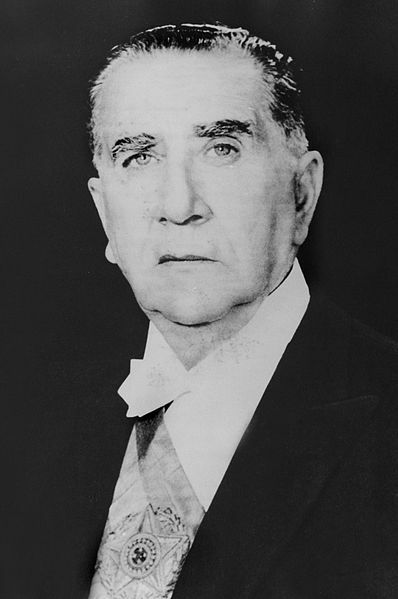 Emílio Garrastazu Médici (1905-1985), the third president of Brazil’s military dictatorship. During his administration, Brazil saw the greatest level of political repression and torture even while the economy went through a temporary boom. Emílio Garrastazu Médici was born in 1905 to immigrant parents – his father was Italian and his mother Uruguayan. Like his predecessor, Artur Costa e Silva, Médici was also born in the southern-most state of Rio Grande do Sul. At thirteen years old, he enrolled in the military school in the state capital of Porto Alegre, eventually becoming a member of the cavalry, a fate not-uncommon among the ranching culture of the south’s gauchos. As with many military men of his generation, he supported the Revolution of 1930 that ushered Getúlio Vargas into the presidency, and fought against rebels in São Paulo who rose up against the Vargas government in 1932. Though in the military during World War II, Médici did not serve in the European theater, instead finishing his officer training in 1944. In the 1950s, he served as a commander of reservist forces before being appointed chief of staff to Artur Costa e Silva from 1957 to 1960. Though not directly tied to the 1964 coup that overthrew president João Goulart, he supported the coup itself. With the new military regime, Médici became the military attache to Washington DC, where he lived from 1964-1966 before returning to Brazil in 1967 to serve as the head of the Serviço Nacional de Informações (National Information Service; SNI), one of the main repressive security apparatuses of the military regime. His service led to his promotion in 1969 to General of the III Army in Rio Grande do Sul. With Costa e Silva’s stroke in August of 1969, the military regime was left temporarily leaderless. Between 1964 and 1969, there had been a behind-the-scenes struggle between “moderates” from Castelo Branco’s camp and “hard-liners” who had supported Costa e Silva. After a one-month junta made up of the heads of the army, air force, and navy, the top brass in the armed forces selected Médici as the next president. Reconvening Congress (which the regime had dissolved in December 1968) just long enough to rubber-stamp the selection of Médici and give the regime the thin veneer of “democracy,” the junta stepped aside, and on October 30, Médici became president of Brazil. 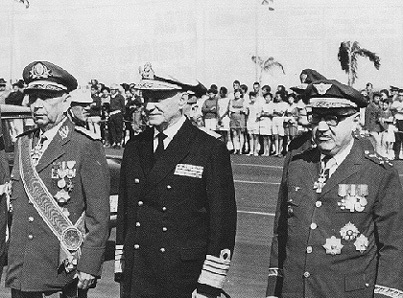 The three members of the provisional junta that governed between Costa e Silva’s stroke and Médici’s presidency: Aurélio de Lira Tavares of the Army, Augusto Rademaker of the Navy, and Márcio de Sousa Melo of the Air Force (l-r). As president, Médici was not afraid to delegate, and under his administration, the armed forces and security apparatuses were given a free reign to employ torture, commit political murders, and use terror to silence opposition to the regime. In spite of the period of intense repression, which witnessed the exile of thousands and forced organizations like the National Students Union into clandestinity, Médici enjoyed widespread popularity. In part, his avuncular appearance helped him; Médici claimed to be disinterested in politics, letting his ministers take care of the daily problems of governance as they deemed fit. Perhaps more importantly to his image, Brazil was in the midst of what came to be known as the Economic “Miracle,” a five-year period that coincided with Médici’s administration and that witnessed over 10% annual growth. Though the “miracle” was an illusion, built on foreign debt that would come to take an increasingly heavy toll on Brazil’s economy and society, the long-term effects would not appear until after Médici was out of office. Nonetheless, his administration played no small part in sowing the seeds of future economic turmoil; in 1970, Brazil took out a loan from the Inter-American Development Bank in what was up to that point the largest loan in Latin America’s history. Perhaps the best example of the incongruence between his administration’s popularity and its human rights violations was exhibited in 1970, when Brazil won the World Cup for a third time, becoming the first country to bring the Jules Rumet trophy home. Médici, a football fanatic who had one year earlier suggested Brazil replace its coach (a move it made), embraced the victory, hosting the national team at the Presidential Palace and posing for photos with the trophy even while his security apparatuses tortured and murdered. 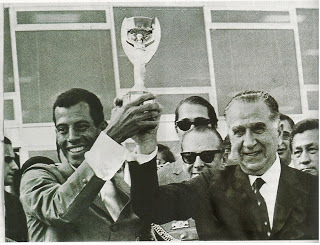 Médici holding the 1970 Jules Rimet trophy with Brazilian football captain Carlos Alberto after Brazil became the first tricampeão (Tri-Champion) in World Cup history. With the economic and athletic success, many Brazilians were blissfully unaware of just how brutal repression had become. Future-president Luís Inácio “Lula” da Silva, who in the early-1970s had just begun his career as a metalworker, later commented that, if there had been a popular and direct election in 1970, Médici would have won in a landslide. He also enjoyed close relations with the United States, drawing on his time spent there as a military attache. In 1971, he made an official state visit to the Nixon White House, where the two men discussed possible ways to overthrow democratically-elected Chilean president Salvador Allende. And to build up support, Médici relied on propaganda in new ways, spending millions of cruzeiros on advertising campaigns designed to drum up patriotic support for the regime through slogans such as “Brazil: Love it or leave it” (“Brasil, Ame-o ou deixe-o“). He finished his mandate in March 1974, leaving office just as Brazil’s economy started to show subtle signs of weakness that would come to plague the country throughout the rest of the decade and into the 1980s and 1990s. As he left office, he enjoyed a massive amount of popularity, seen as the man who finally “stabilized” Brazil, even while many of the economic policies that had created the “miracle” preceded his administration. While he was popular while serving as president, his popularity quickly faded away. The growing economic turmoil of the 1970s, which proved increasingly difficult to curb, led more and more people to question the policies of his administration. In the 1980s, the Catholic vicariate of São Paulo and Protestant ministers managed to secretly obtain thousands of classified documents that detailed the use of torture in Brazil during Médici’s government; the documents, ultimately compiled and published as Brasil: Nunca Mais (“Brazil: Never Again,” translated into English as Torture in Brazil) shocked millions of Brazilians who had been unaware of (or had chosen to ignore) the extensive use of torture in the 1970s. Though at the time people referred to the Médici years as the “economic miracle,” these years ultimately became known as the “Years of Lead,” due to the regime’s heavy repression. Médici rarely faced such criticisms directly, however. He retired to a private life after leaving office, rarely speaking out in defense of his government. Indeed, he did not grant an official interview with anybody until the early-1980s, though some friends and family members (including one of his sons, a university professor), spoke out in his defense periodically. He died of complications from a stroke in 1985, just two months shy of his 80th birthday. With the passage of time, he has become a symbol of the disfunction of the Brazilian military regime, a president who at best was unable to control his subordinates in their blatant and extreme use of torture and murder, and at worst openly supported and encouraged such actions behind the scenes even while condemning the “isolated” use of torture publicly. This is part of an ongoing series. Other entries have included musician Tom Zé and writer Rachel de Queiroz. This entry was posted in Brazil, Brazil's Military Dictatorship, Get to Know a Brazilian, Human Rights Violations, Torture. Bookmark the permalink.